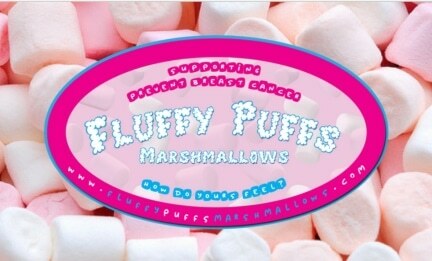 Fluffy Puffs Marshmallows support the Chris and Gabs World Cycling Tour. Pink and white mixed marshmallows in 7.6g packets. Every penny raised goes directly to Prevent Breast Cancer and a free ‘Be Breast Aware’ booklet comes with each purchase.